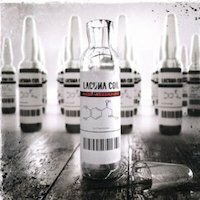 The biggest metal band from Italy must, without a doubt be Lacuna Coil. They were extremely close to making it big time with their 2006 album Karmacode. The scored a minor hit with a great cover of Depeche Mode’s ”Enjoy The Silence”, the album sold well and the tour that followed drew a pretty big crowd wherever they went. Besides, they have an ace up their sleeves in female singer Cristina Scabbia, a not only great vocalist, but also a hot one! Unfortunately they failed miserably at following that up. The follow up CD Shallow Life from 2009 didn’t even come close to neither the sales or the quality of its predecessor and since then it has been awfully quiet around the band. So quiet in fact, you might wonder if they had split up after the failure of the last CD. And then BOOM, all of a sudden a new album is about to be released. More curious than aroused, I found myself eager to see if the band had learned from their mistakes and made an album for themselves instead of listening to greedy record company executives. The answer is both yes and no. First up, it really feels like the band has gone back to their older ways of writing songs. On the other hand, it feels like something in the back of their minds are still longing for the hit song that might break them big. ”Give Me Something More” is in that vein, dark, but catchy and slightly commercial. A pretty good song though. ”Upside Down” is more like it. Heavy, aggressive, yet both melodic and catchy. With ”End Of Time” they are back to the former again, a gothic pop song dressed up as metal. ”Intoxicated” hints at modern metalcore, very commercial and aiming at American radio, but it is a very good song that will stay in your head a long time after playing it. They have recorded another cover. This time it’s ”Losing My Religion” by R.E.M. It’s not bad, but the original is much better. Where they succeed at making ”Enjoy The Silence” their own, this one feels pretty pointless and desperate, I’m afraid. However, they have made a good album, way, way better than their last one, but still it doesn’t really cut it. The sound is still too much gothic pop metal and the album contain too many mediocre songs and why so much male lead vocals? They have a killer singer in Scabbia, so why don’t use her more? On this album she’s unused too often. This album has to be seen as a somewhat new start for the band and if they stop the commercial ways of thinking and do what they do best, hard, dark, aggressive but melodic Gothic metal, the big break might turn up the next time around.